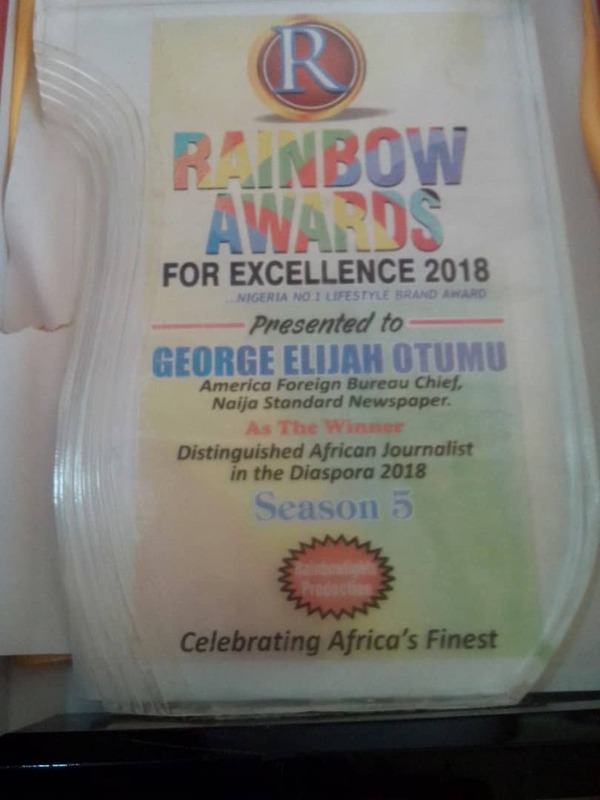 AS THE YEAR GRADUALLY WOUNDS UP, honour has come the way of our hardworking American Foreign Bureau Chief, GEORGE ELIJAH OTUMU, as he has just won the ‘Distinguished African Journalist of the Year Award 2018’, going by a story published on October 26, 2017 titled: ‘NIGERIA’S BEST THREE Orthopedic Surgery Doctors in AMERICA Unveiled’, which revealed how three Nigerian medical doctors were shinning stars at Avante Orthopedics in Washington DC, Maryland, Texas with specialty in joint replacement surgery of the hip, knee, fracture care, work-related injuries, sports medicine and athletic injuries. 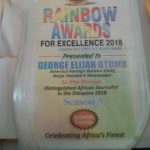 As this 5th Rainbow Light Ceremony holds Sunday, November 25th at Presken Hotel Resort Limited, Ikeja, Lagos, celebrities and awardees have confirmed attendance at this historic event. Other Awardees include: His Royal Majesty, Oba Enitan Adeyeye Ogunwusi, Ooni of IFE, First Lady of Anambra State-Chief Mrs Ebelechukwu Obiano, Prophet T.B. Joshua, Founder Synagogue Church of All Nations, Bolanle Sarumi, Ashabi Aliyu; Primus Odili, Wale Samson and many outstanding Nigerians. General Kollington Ayinla, a music icon in Nigeria was conferred with Lifetime Achievement Award for his unparalleled success and accomplishment in the Fuji genre industry.